P. & A. America, Inc. Turn your favorite digital photos into realistic looking paintings such as watercolor, oil painting, etc. with a few simple mouse clicks! No difficult setup is required. Your photos are turned into paintings in front of your eyes in a few seconds. Virtual Painter 5 could not be any easier to use. All you need to do is to open a digital photo, select one of the 16 painting styles, then click OK to let the application do the work for you. There are three versions of Virtual Painter 5, Standalone, Plug-In and Deluxe version. The Standalone version of Virtual Painter 5 runs by itself. It does not require any other applications. You can start enjoying the world of Virtual Painter once it is successfully installed with your computer. The Standalone version would be a great choice for most PC users. The Plug-In version of Virtual Painter 5 runs as a "plug-in" to popular graphic applications such as Adobe� Photoshop�, Corel� Paint Shop? Pro�, etc. 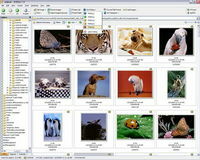 The Deluxe version of Virtual Painter 5 is a package which includes both the Standalone and the Plug-In version of Virtual Painter 5. This is a complete package for advanced graphic users who want to take full advantage of the program. 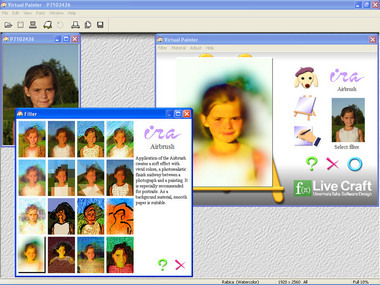 Virtual Painter 5 is not a painting tool that you must master to create your own works of art. Rather, the filters it offers are like agents, virtual artists who have their own characteristic techniques and methods. You can preview their art and even request a few changes, but you can leave the hard work to them. Sit back and watch them paint. You are sure to be pleasantly surprised, time after time. Happy virtual painting!